When we launched Amazon Business in 2015, we changed the way businesses made purchases on Amazon by introducing a marketplace for our business customers, along with features and benefits tailored to their needs. We also introduced business-only pricing and selection, free two-day shipping on qualifying orders, powerful analytics tools, and more. Today Amazon Business provides easy access to hundreds of millions of products – everything from IT and lab equipment to education and food-service supplies. And with business-only pricing on millions of products and access to more than 85,000 business sellers, Amazon Business helps buyers get the selection, convenience and value they’ve come to know and love from Amazon. But this milestone hints at something much bigger—our relentless passion for innovation to better serve business customers of all sizes and across industries. And it’s amazing to see how our customers are using Amazon Business to transform procurement within their organizations. Amazon Business saves companies money and time by improving spend control and offering a one-stop destination for spot buys and strategic purchases. By consolidating spend under Amazon Business, organizations are able to simplify purchasing for buyers and gain access to a competitive marketplace and exclusive business prices. Read the full announcement to learn more about how some of our customers are using Amazon Business to transform their procurement organizations. 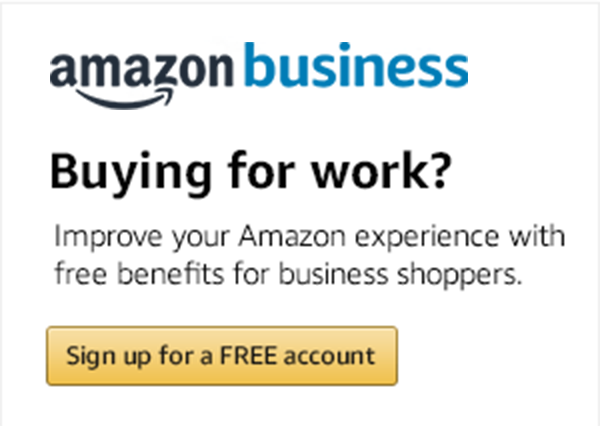 Or, create a free Amazon account to access all the benefits of Amazon Business.